< i>"There's no chin behind Chuck Norris' beard... only another fist." The other Republican candidates may have more money and better poll numbers, but Arkansas Gov. Mike Huckabee isn’t worried about any of that. 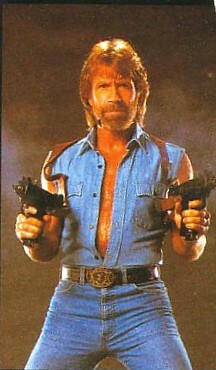 He is the only GOP contender who can claim support of the imposing force that is Chuck Norris. In a new TV ad set to begin airing this week in Iowa, Huckabee appears alongside the action movie star and cult icon with a warning for voters. “Chuck Norris doesn’t endorse. He tells America how it’s gonna be,” Huckabee says in the new ad. After cleaning up the Lone Star state as “Walker: Texas Ranger,” and fighting terrorists in “Delta Force,” Norris is taking his roundhouse kicks to the campaign trail on Huckabee’s behalf. If Norris can turn Barry Gabrewski from bully victim to karate champion, he’s certainly a good “Sidekick” to have. While Norris tells viewers Huckabee’s plans to “protect our 2nd Amendment rights” and “put the IRS out of business,” the candidate shares some insights about the movie star. “My plan to secure the border? Two words: Chuck Norris,” Huckabee says. The commercial below, available at mikehuckabee.com, is scheduled to begin airing in Iowa on Monday, November 19, 2007.